I know what you are thinking. How can she have the guts to claim such thing?! 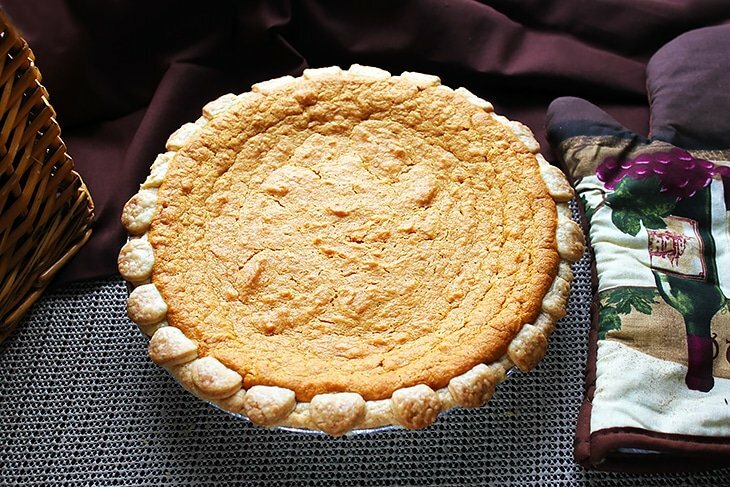 Believe me, I thought many times before typing this title, but I honestly couldn’t find another for this particular pie than The Best Sweet Potato Pie Recipe. I had the pleasure to taste few sweet potato pies, but there was always something a little off about it. Either it’s too sweet, full of corn starch, filled with spices, or the texture is a little runny, and the crust was never tasty. 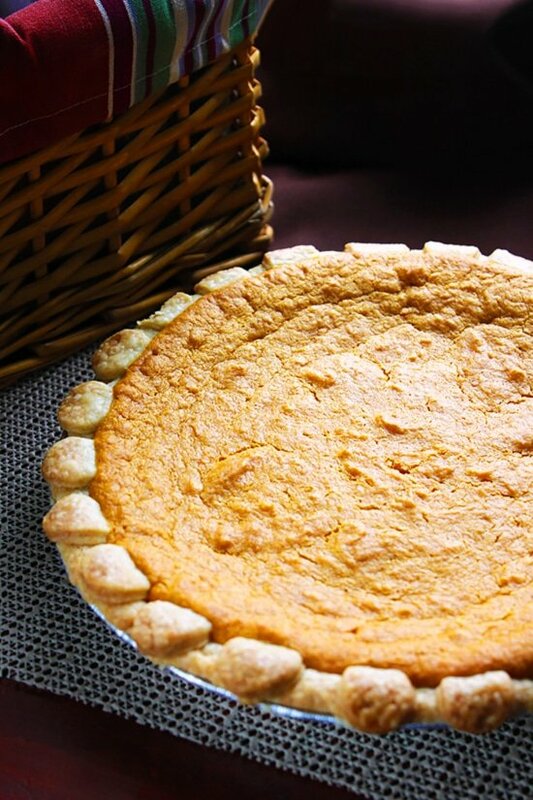 My husband loves sweet potato pie, and when making this recipe, I kept him in mind and tried to create it to match his taste and liking. This is how I came up with The Best Sweet Potato Pie Recipe. I used a sweet crust it tastes almost like shortbread. It’s flaky and light, yet when you cut it, you get a nice clean slice. The filling is what took a lot of brainwork. I didn’t boil the sweet potatoes, I baked them. 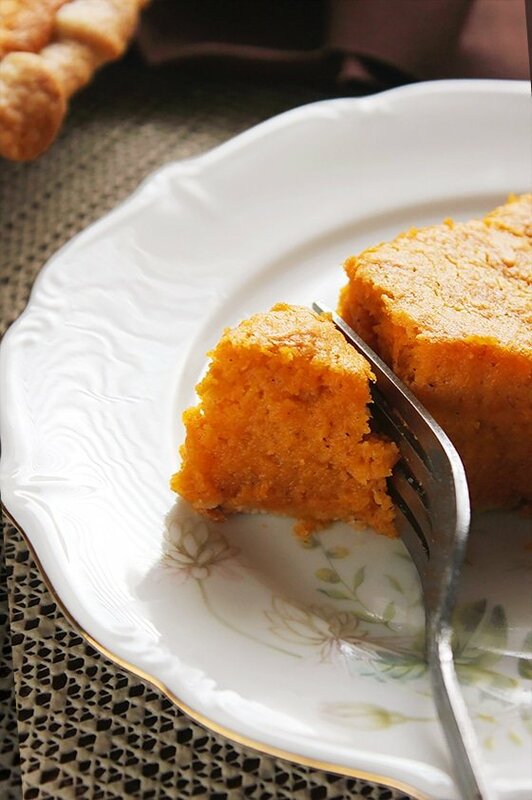 This caramelized the sweet potatoes, which resulted in me using less sugar, and less sugar means you will be able to taste all the spices used in the filling plus the caramelized flavor of the sweet potatoes. 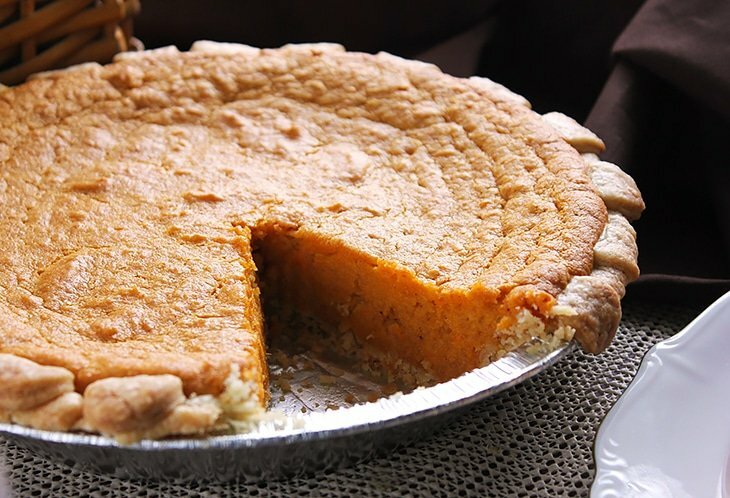 Now that’s one trick to making The Best Sweet Potato Pie. The other trick is beating the filling by using a hand whisk or a whisk attachment. This will make the filling light and fluffy and will result in a texture similar to soufflé. By the way, this pie will look like the image below when you take it out of the oven! It’s normal. My husband and my in-laws raved about this pie so much, I almost didn’t want to share it with you guys, and just keep it aside as a family treasure, LOL! I’m kidding of course, but calling this pie The Best Sweet Potato Pie, was only fair. 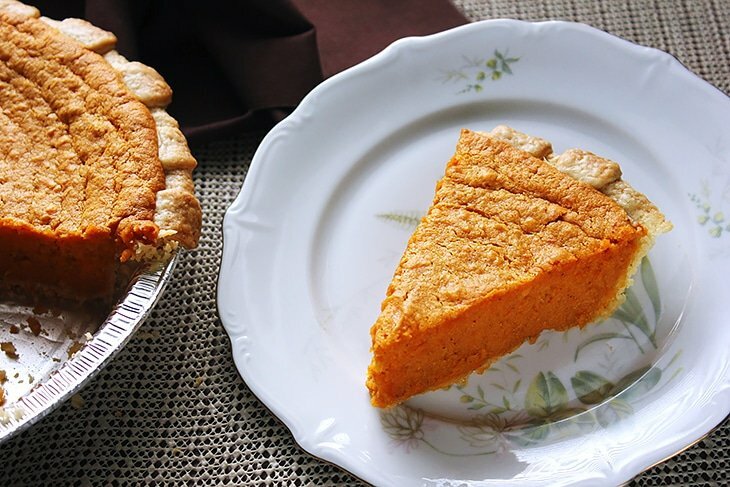 This Best Sweet Potato Pie makes a shortbread-like crust, and a soufflé like filling, the flavor of spices used is balanced so is the sweetness. In a bowl, add all the ingredients except the water, mix using your fingers. You will have a wet sand like texture and will see few bits of butter but that’s alright. Add the water and mix well for few seconds, form a ball, press it down to form a disc. Cover with plastic wrap and refrigerate for at least 30 minutes to one hour. Lightly flour your working surface and the dough too. Dust the dough and the working surface whenever you feel it is sticking. With the help of the rolling pin, roll the dough onto the rolling pin, and then unfold it into your pie pan. Gently fit the pie crust to the pie pan using your fingers. Prick the crust all over with a fork and refrigerate. Peel the sweet potatoes and cut into slices. Mix the oil with sweet potato slices and place it on a non-stick baking pan. Bake for 20 minutes, then flip the slices and bake for another 22 minutes. Add the baked sweet potato in a big bowl, and while still hot, add all the ingredients except the eggs. Beat on low using a whisk attachment, then increase the speed and beat until well combined. Add the eggs and beat until fluffy for two to three minutes. Take out the chilled pie crust from the fridge. Pour the filling in the crust and bake for 55 minutes. The pie should rise like a soufflé, but it will sink a little and will look beautiful. I’m glad you decided to share this wonderful recipe with us! Such a lovely looking pie! It does look wonderful, that’s for sure. I love how it cuts so cleanly and looks so moist and full of flavor. YUM! Buttery crust and creamy smooth filling…a heavenly combo! Mine always turn out cracked (and a bit dry). This one looks so nice – I could only wish for mine to turn out so well. My hubby would absolutely love this! Sweet Potato Pie is his favorite! My oldest daughter loves sweet potato pie! I might have to surprise her with this for desert one night. 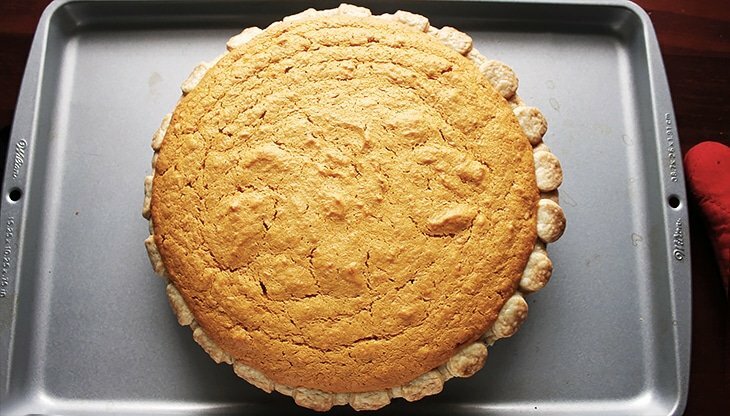 This does look like the best sweet potato pie recipe ever. I have not eaten sweet potato pie like this before. This is a beautiful looking pie. I have always wanted to make a sweet potato pie. Making a good crust always scares me away from making pie..but this looks pretty tempting. Making this pie is easy, and the crust is forgiving, adding more flour will not kill the flavor when added during the rolling. 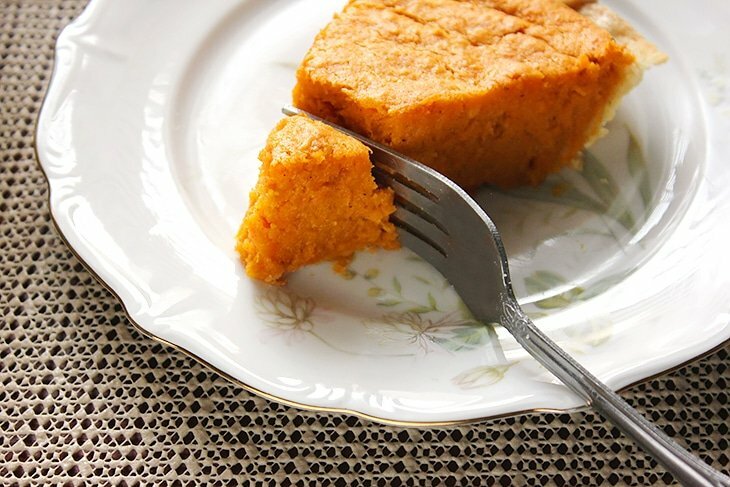 Oh Muna, your sweet potato pie looks incredibly delicious. I must say out all the pies this one is one of my favorites. 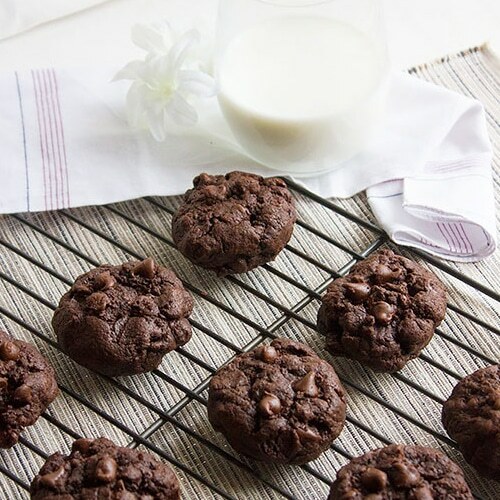 Stunning clicks and wonderful recipe… Also, your new site looks amazing! Thanks a lot my friend 🙂 this is indeed the best pie I ever had. Thanks for your kind words! I just finished cooking your recipe of sweet potato pie. It looks amazing. I have it setting until tomorrow. Thanks for the help. I saw your recipe & I knew it was the one I wanted to try. 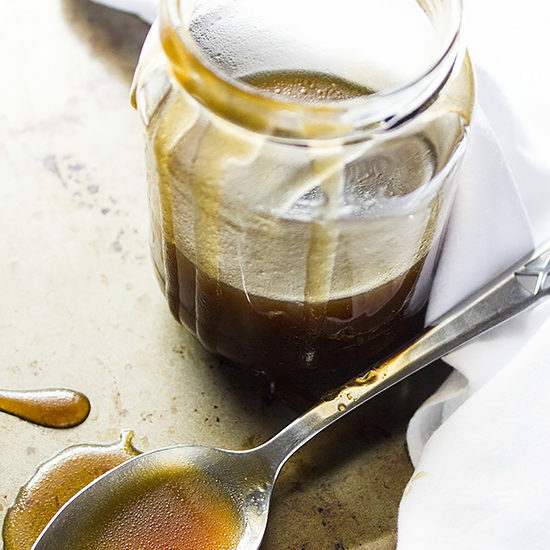 What type of oil do you use – it says spoon oil? Any cooking oil will do.